The Rombergpark has its origins in Brünninghausen, a classical moated castle which belonged to the von Romberg family. In 1927, the von Romberg family sold Haus Brünninghausen and its park to the town of Dortmund. Today, the wonderful sweep of the broad meadow valley created by the Schondellenbach stream forms a generous swathe of ground for the landscape park and its comprehensive collection of trees and shrubs. The finely-structured rise in ground on both sides of the valley enables visitors to go for especially varied strolls in the gently rising and falling side valleys. Venerable giants of trees, in some cases with ivy growing right to the top, emphasise the park’s tranquillity and act as a source of relaxation for visitors. Whether directly beside open fields, as solitary features, in the tall wood or between flowering shrubs, the trees are an attractive sight in every season. The small and large pools, sources and ponds in the Rombergpark are home to many different water birds. Today, Romberg Botanical Garden acts as a fertile symbiosis for all its visitors through its history, its extensive collection of plants, its broad educational programme on the natural world and the way it is used as a local recreational area. Romberg historical landscape park and botanical collection is a successful synthesis which unites garden design, a scientific collection of shrubs and trees, relaxation and the stimulation of all the senses. The main park entrance is dominated by the historical gatehouse. Horse chestnut trees grow around the building, which is located on the former castle moat. The impressive linden avenue, laid out by Weyhe in 1822, provides shade on hot days and opens up a vista towards the large pond and the bastion with its romantic location on the water. One of the Rombergpark’s splendid specimens throughout the seasons is the more than 180-year-old fernleaf beech (fagus sylvatica Aspleniifolia), most probably planted by M. F. Weyhe himself. The large valley meadow formed by the Schondellenbach stream features striking solitary trees and groups of trees. It links the individual areas of the park, each of which has a distinctive character. Next to the clematis garden is the English shrub garden. Modelled on English gardens, it was created by volunteers from Staudenfreunde Dortmund (Friends of Shrubs in Dortmund). The moor and heath landscape is intended to give visitors a good idea of this unique and greatly endangered form of landscape. 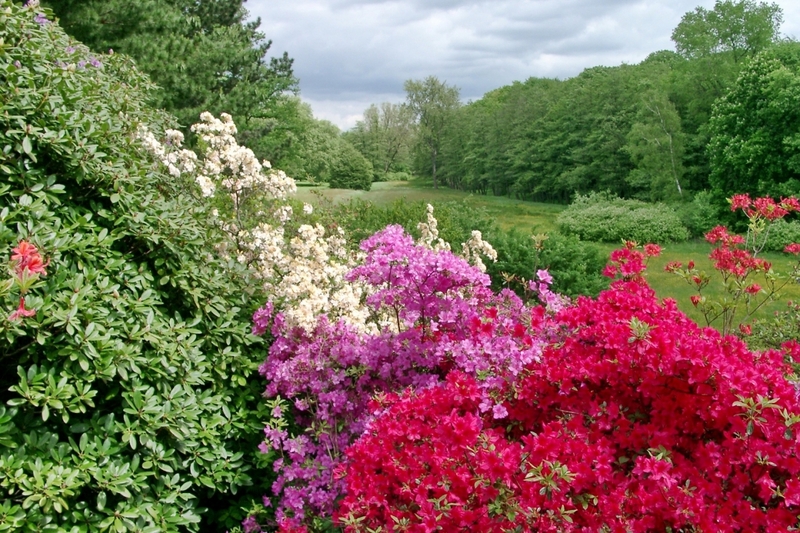 Next to it is the rhododendron wood, with over 100 varieties of rhododendron and azalea. It is above all worth seeing when the shrubs are in flower in May. The medicinal garden is located behind the teaching apiary and is likewise used by schools for instruction. An unmistakable element of this formal area dating from the end of the 1920s is the circle of poplars in the former school garden. The drop in height along the whole length of the small dip formed by the Primeltal (primrose dell) only comprises about 10 metres. A russet-coloured stream which rises in the park flows through the dell. While many different types of fern grow in the upper part, the swampy ground of the lower part is dominated by candelabra primroses. Visitors will find flowerbeds planted with summer flowers and a water-lily pool which is particularly popular with children in front of the tropical houses. The Café Orchidee and the terraces can also be found there. The origins of the Rombergpark lie in the distant past. Brünninghausen, a classical moated castle which belonged to the von Romberg family until its destruction in World War Two, once stood approximately where “Hotel Rombergpark” can be found today. All that now remains of the once grand castle is the gatehouse dating back to 1681. At the beginning of the 19th century, the Düsseldorf court gardener Maximilian Friedrich Weyhe was employed to redesign the green areas around Haus Brünninghausen in order to create an English landscape park. Today, Weyhe’s landscape park remains the heart of Rombergpark Botanical Garden. In 1927, the von Romberg family sold Haus Brünninghausen and its park to the town of Dortmund. The park has been open to the public ever since. Richard Nose, the first director of gardens and cemeteries in Dortmund, planned to expand the park by adding a botanical garden and an arboretum. Nose began his work on the botanical garden in 1928 by laying out a new, formally-structured school garden to the west of the old park. A short time after the completion of the botanical school garden, Nose thought about enlarging the area. An arboretum was to be created to the south of a small wood through which there were already a number of paths. From 1930-1933, an approximately three-hectare, formally structured arboretum following Engler-Prantl’s botanical system was created to the west of the large valley meadow as an individual, self-contained area. Today, the stocks of both the Rombergpark and the arboretum continue to be constantly expanded. A few cases will serve as examples of this practice, notably the planting of extensive ranges of medicinal plants in 1973, the creation of a clematis garden in 1978 and of a large heath and moor biotope covering approximately 6,000 square metres in 1989. In the mid-nineties, new shrubs were acquired for the botanical garden. Heribert Reif, the current director of the botanical garden, planted above all viburnum, forsythia, weigelia, mahonia, cherry laurel, new magnolias and a range of endangered rhododendrons and conifers. 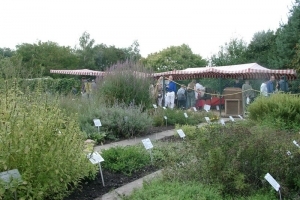 Today, the botanical garden still fulfils its role as a botanical garden because it acts as a productive symbiosis for all its visitors through its history, its extensive collection of plants, its broad educational programme on the natural world and the way it is used as a local recreational area. Maps of sites/ visitor information: Information board at the Northern entrance (Torhaus), many plants are labelled.